Every 7 minutes, for 28 minutes – 4 rounds. Every 3 minutes, for 7 sets – 140ft yoke carry. Add weight each set if possible. Boston firefighter Michael Kennedy, 33, of Boston, Massachusetts, died fighting a nine – alarm fire on March 26, 2014. Kennedy served with the Boston Fire Department for six and a half years and was a Marine Corps sergeant who served a tour in Iraq before that. 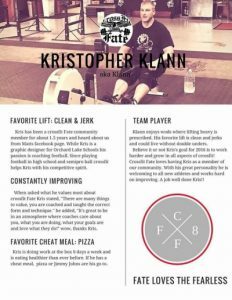 He had a big presence in his local CrossFit community, coaching and training at several affiliates. He is survived by his girlfriend, Sarah Wessman, and many other beloved friends and family members. 1.) 12 walking lunges – Barbell, alternate steps. Build to a heavy 12. 2.) 20 Banded wood chops – keep band tension the same. 6 etc.. until the time expires. Strength – Every minute on the minute, for 12 minutes – 4 sets. 2.) 2 Hang power cleans – 1 above the knee & 1 below the knee. 3.) 2 Low hang power cleans – "2 off the ground. *Add weight after hitting all positions! Focus should be on technique today. On a 18 minute clock: Perform 5 rounds of the assigned work… then with any remaining time establish a 1 rep max power or squat clean. Your score is total weight successfully lifted. With remaining time find a heavy power or squat clean. 1.) 12 seated dumbbell strict press – (6R/6L) *Move up in weight if possible. 2.) 6 Strict chin ups – 3 second negative on each rep. 3.) 1 minute sandbag hold – bearhug style. Use the heaviest weight possible. Every 4 minutes, for 20 minutes – 5 rounds. *Score is slowest and fastest round times added together. Please join us at 10 for a free community workout!! Looking forward to meeting everyone! 10 Rounds of: 150ft single arm farmers carry (75ft/75ft) – Rest 60 seconds between rounds. Use kettlebells or dumbbells for all sets!! Build in weight from round to round.